We're on an Energy Star, energy savings roll at my house! Last night my husband installed this light at our front door ~ the wall bracket in the lower right. I love it! 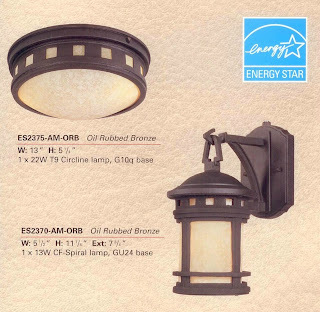 All Energy Star outdoor fixtures have a built in photocell, so it will come on at dusk and turn off at dawn. It uses a 13-watt fluorescent lamp, which is equal to about 60 watts in incandescent, and it is the PERFECT amount of light! The amber glass, along with a warm color temperature on the lamp, makes the color of the light look exactly like incandescent. Designers Fountain, the manufacturer, says Energy Star lighting provides bright, warm light but uses about 75% less energy than standard lighting, produces 75% less heat, and lasts up to 10 times longer (I'll keep you posted on its longevity! ).